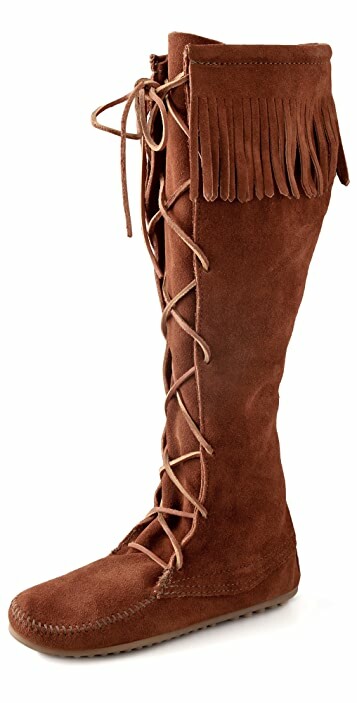 These knee-high suede flat boots feature a lace-up tie and a fringed cuff. Topstitched seam at vamp. Rubber sole. I am so very pleased with the color,comfort and fit. Had they had them in black and dark brown I would have order those colors as well. I just received my boots in the mail but unfortunately I will be exchanging them for a smaller size. I am a true size 6 and these were clearly way too large. I read past reviews of how they fit true to size but I guess that was not the case for me, even if I did attempt to wear the thickest socks. However, I was very impressed by the style and am happy with my purchase. The suede looks super rich and the calf width did not seem too wide. 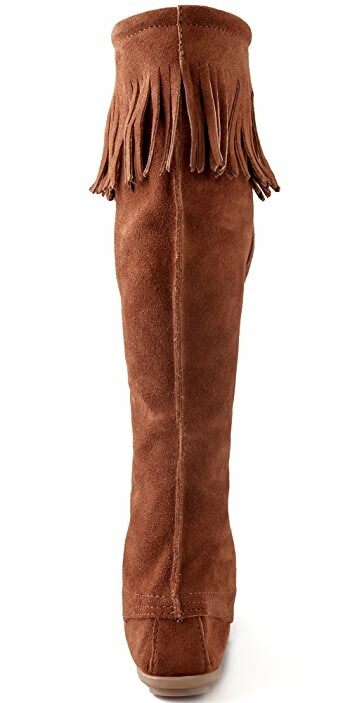 I love these boots - they are so comfy and fun! The colour goes with so many different things and the price is really reasonable. On me they were a little bit large, but I put "as expected" because it was not enough to warrant going down a size and won't be a problem. Only reason I gave 4 rather than 5 stars is because they are quite hard to get on and off (especially off!) since the suede has so much grip. Also, when I was threading the laces, they were kind of...shedding (?) a bit, although I have a feeling this will stop over time. Overall really happy with these boots! Best of Minnetonka!!!! Comfortable as always, the color is unique and matches everything!. I saw Kate Moss rocking these with shorts and a sweater. I fell in love. After doing research, it's true that these are as comfortable as walking barefoot on a plush rug. Although a little difficult to lace up and take off, they are definitely a key item for your closet. I look forward to rocking them with dresses as well as shorts. I wish they came in half sizes, I'm usually a solid 9 but these were a little big, which is fine with socks. If you are a half size in between, def. go for lower size. These are too cute. I cannot wait to wear them (if the rain ever stops). The color is so very complimentary. They look good with just about anything (jeans, skirts, shorts, etc). They are just too fun. 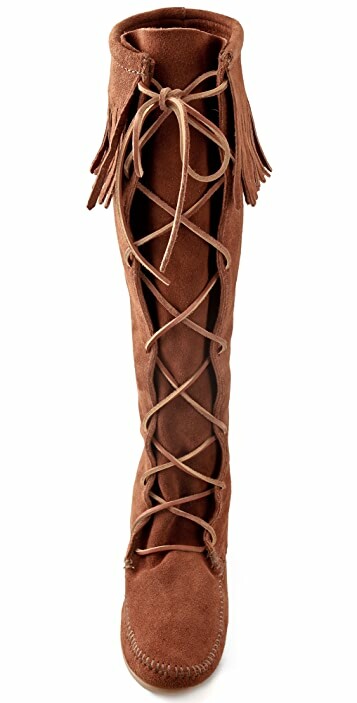 I saw these boots at Nordstroms but they didnt have my size so I knew I had to order them when I saw them on my favorite site Shopbop. I usually wear a 9 but the 9 was too big so I ordered an 8 and they fit perfect I just received them yesterday. I love them already for days when I dont feel like wearing 5 inch heels but still want to look trendy :) They are hard to get off though but are extremely comfy. I thought it must be E.T. language when I first heard the name "Minnetonka". But now I know why it's so famous. These Boots are so comfortable, yet stylish as my legs look longer. Only one drawback is hard to take off.